Applique techniques to embellish your cushions. personalise your cushions with favourite themes. Applique techniques are used when some additional work is "applied to" or " laid on" another material be it in metalwork or needlework. This type of sewing is different from patchwork. The end result is not a new piece of fabric made up of oddments of other pieces but different shapes and pictures sewn onto a bottom layer of fabric either by hand or machine. This type of sewing or embroidery started as a need to repair worn household or clothing items but it has now turned into an art form in itself. In Britain in the Eighteenth Century this technique was used to preserve delicate and expensive fabric, like the Indian tree of life design, and in turn make new covers for beds or walls. Different kinds of ways in which this type of decoration is used can be seen in different areas of the world. 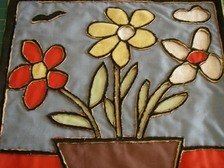 Applique Techniques around the world and ways to apply. Gujarat, in India, use this for cushions, bedspreads and door-hangings and in Thailand they use a reverse form on their clothes. This is where layers of material are then sewn with a pattern and then cut out to show the underneath colours. This gives a form of depth to the fabric. One of the more well known kinds are the American quilts, these were made by the early settlers to keep themselves warm and these became more elaborate as they had more time to dedicate to this hobby. In the 1930s when the depression came then this type of needlework went back to the original purpose of the need to repair worn items. Printed Fabric - cutting pictures from fabrics and making a new design. Lace - cutting individual parts of lace and re-assembling them, mixing old and new lace. When learning how to appliqué, ribbons are a good starting point for making patterns as their edges are already finished. They come in many different colours, patterns and widths. The pieces of ribbon can be held in place with fabric glue to stop it from moving when sewn with the machine. Once the basic steps have been mastered then wonderful creations can be made. Homecraft have a supply of small pieces of fabric to help in getting the look you want, not forgetting the books that are available in many shopping outlets like Amazon. Enjoy trying out this craft as you will be encouraged by how well it looks.